Yathit browser extension works even without login to Yathit server, however to persist setting and additional features for licensing, you should log in to Yathit server. In the Yathit sidebar, go to about page, . 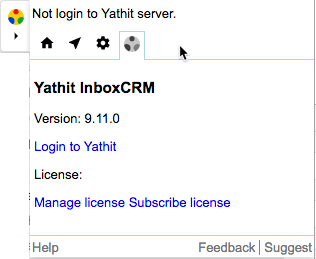 If you are not login, you should see “Login to Yathit server” link, as shown below. Similarly, you can login in Yathit sidebar home page, . The button can be hided using setting however. Click the Login button to begin. In Chrome, it is possible to login with Chrome Profile presing shift key.